Stop number 26 on the National Hot Dog Month Tour was Harbor Dogs in Scituate, MA. This is probably the coolest location for a hot dog cart we have seen all month: right on Scituate Harbor. There's lots of boat traffic, especially on weekends, and Harbor Dogs is on Scituate's "main drag," so there's good foot and vehicle traffic too. Harbor Dogs owner, Mike Healy is a life long Scituate resident and a local fire fighter. He started in the hot dog business this spring and hopes to grow into a strong catering operation. When Mike has to be at the station, he has "his man Will" taking care of business. Drew Bennett was back, with his camera and artful eye. You can see all his photos on the Hot Dog Stories Facebook Page. 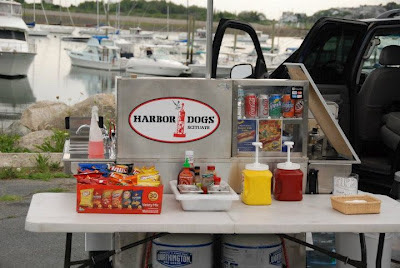 Get the full story on our visit to Harbor Dogs on Hot Dog Stories.